Discussion in 'General Knife Discussion' started by Stumpy72, Sep 15, 2018. I’m looking at the new Spyderco Paramilitary 2 with the 52100 blade and peel ply CF scales. It’s >$10 more than the S110V w/ G-10 scales version and >$20 more than the S35VN with G-10 scales version. I tried searching 52100 but I didn’t find much. From what little I could find, it looks like another premium steel somewhere in a league with M390, S20V, etc. Can anybody fill me in on what 52100 is like and whether it’s worth a price in that ballpark? 52110 never heard of it. Do you mean 52100? DocJD, danbot and jbmonkey like this. I believe that you're talking about 52100 and not 52110. That may be why you didn't find much. Anyhow, it's a carbon steel that holds a decent edge and is really easy to sharpen. It won't be in the same league as M390, S30V, or S110V, but it'll be a great steel that's very serviceable. As far as it being "worth it," that's up to you. its a ball bearing steel. very decent carbon type steel. think not stainless. holds a good edge and takes a sharp edge. Yeah.... I meant 52100. I think I need to sign up for Paying Attention Lessons. I changed it in my post, but it seems I can’t change the thread title. cigarrodog and DocJD like this. Thanks. If 52100 isn’t in a league with M390+etc then I have to guess that price must be more driven by the fancy scales. Am I correct with that guess? I would assume that they play a part in the price. There could be a number of reasons why the price is higher though that we don't know. It could be something like it's expensive/harder to work with, harder to obtain, price for stock could be more because they aren't buying in as a high of a volume since it's a sprint run, etc. The only person that knows for sure is @Sal Glesser. It's purely speculation on our side. Regardless, it's a cool knife with a unique steel. 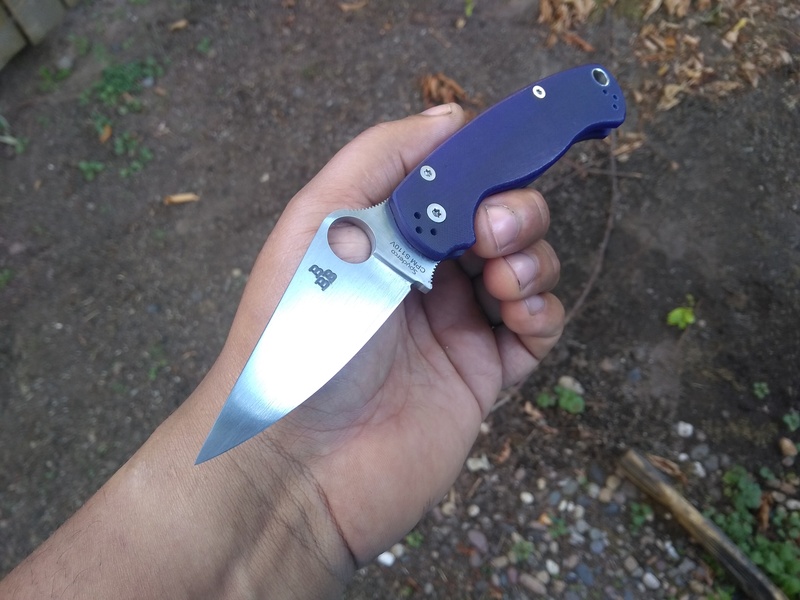 I imagine this is probably a very subjective thing, but... Do you think 52100 is better than taking and holding an edge than S110V or S35VN? It will definitely take an edge easier than either one of those steels. You also won't need as expensive equipment such as diamond stones to sharpen it. However, it's not going to hold an edge anything like modern day super steels. It will have respectable edge retention but it's not really even in the same class of steels. 52100 is a ball bearing steel, as already reported. It is a very fine grained steel when heat treated well, and takes and holds a very good edge. It is better suited to narrow angles and push cutting level sharpness in my experience. If you want to saw with your knife, stick to one of the high carbide forming steels. from what I've read it's hard to come by in sheet form for cutlery. that's likely part of the cost. it is a very good steel for cutlery like all ball bearing steels are for the most part. Thanks for your detailed help. Great smiley face usage, too. That used to be true, not anymore. It's one of the more affordable steels knife makers can get into when buying flat bar but needs alot of control to heat treat so it's not recommend to beginners. jjblackhawk and jbmonkey like this. S110V will hold an edge for quite a long time. But it's difficult to sharpen. S30V has always lasted a good long while for me. I'm a big fan. Plus , they're both stainless which is what I prefer to carbon/tool steels. Also , to edit a thread title , go to "thread tools"located above your first post in this thread. The choose to edit title. There it is. A mention of heat treat. Lots of talk lately about super soft sebenzas and whatnot, so yes, properly heat treated 52100 can outperform the others in all categories (besides stain resistance, of course). As far as price comparison...gotta love that patina! The added cost for the 52100 model is for the Carbon Fiber pell ply scales and probably the QC to keep it from rusting at the factory . Both are interesting models, not really good to compare to each other since they're at opposite ends of the spectrum and have more trade offs then other steels at the middle of the spectrum. You may be dissapointed if you don't know what you're getting into. The 52100 will sharpen faster and easier like some other posters already said. The main advantage to the 52100 is if you like to sharpen or you like patinas. If you're just looking for a maintenance free EDC or have no interest in sharpening and polishing edges then stay away. The edge on the 52100 will be more stable and less prone to microchipping with improper use but that doesn't make it a cold chisel or a prying tool. Those uses are geometry more then steel and are a trade off with cutting performance. Thicker = durable, less cutting performance. So it's better to go thin and use better judgement in use. The s110v requires less maintenance, but will need more select abrasives to sharpen. Even if you're broke, SiC sandpaper works and is cheap, no excuses. Buying a knife in s110v doesn't mean you don't have to sharpen it. The s110v will physically cut longer then the 52100. The s110v won't stay sharper longer but it will cut longer. Also, sharpness is the sharpener, not the steel. The s110v is more prone to chipping then the 52100, but the 52100 will blunt and roll and physically stop cutting under the same duration of similar use. The 52100 will strop and hone better then the s110v but the s110v will also stroping and hone well too if the edge maintained at the same frequency as 52100. The s110v has an "endurance mode" and will have a more aggressive edge at lower grits. The 52100 will be easier to sharpen out damage, reprofile and polish the edge. The s110v is definitely tough enough for cutting jobs but it's more sensitive to user error and abuse at the edge. Someone that will get the most enjoyment out of s110v is someone that takes care of their edges and does lots of cutting with no time to stop and hone or clean rust off the blade. Both of these steels are at the more extreme ends of the spectrum so you'll have to cater your use and preferences to the strengths of these steel to get the most enjoyment. Also make sure you check out the Cruwear Pm2 which will offer the best compromise between the s110v and the 52100, also a little cheaper. You might like Cruwear more. Nautique, ScooterG and jbmonkey like this. Part of the cost may be heat treatment as it would require oil quenching rather than air quenching. hugofeynman, DeadboxHero and jbmonkey like this. You would love S110v with a 15 dps edge on a 0.005" behind the edge regrind with a 1500 grit CBN waterstone finish Stropped at 1um on diamond. I Wish more people could experience higher alloy steels with thinner behind the edge geometries. 353, Tommy-Chi, eKretz and 1 other person like this. Thinner behind the edge is always good. I thin all of my blades also.